APT #SM48122. 4" Cutter Diameter x .375-.530 Cutting Width Range x .330 Cutting Body Width x 1-1/4" Arbor Diameter. Slot Master Adjustable Width Indexable Milling Cutter - Arbor Type. Uses CTA Inserts. Click on "more info" for tool details. APT #SM48124. 4" Cutter Diameter x .485-.765 Cutting Width Range x .450 Cutting Body Width x 1-1/4" Arbor Diameter. Slot Master Adjustable Width Indexable Milling Cutter - Arbor Type. Uses CTA Inserts. Click on "more info" for tool details. APT #SM612122. 6" Cutter Diameter x .375-.530 Cutting Width Range x .330 Cutting Body Width x 1-1/4" Arbor Diameter. Slot Master Adjustable Width Indexable Milling Cutter - Arbor Type. Uses CTA Inserts. Click on "more info" for tool details. APT #SM612124. 6" Cutter Diameter x .485-.765 Cutting Width Range x .450 Cutting Body Width x 1-1/4" Arbor Diameter. Slot Master Adjustable Width Indexable Milling Cutter - Arbor Type. Uses CTA Inserts. Click on "more info" for tool details. APT #SM612126. 6" Cutter Diameter x .720-1.025 Cutting Width Range x .690 Cutting Body Width x 1-1/4" Arbor Diameter. Slot Master Adjustable Width Indexable Milling Cutter - Arbor Type. Uses CTA Inserts. Click on "more info" for tool details. APT #SM612128. 6" Cutter Diameter x .982-1.265 Cutting Width Range x .950 Cutting Body Width x 1-1/4" Arbor Diameter. Slot Master Adjustable Width Indexable Milling Cutter - Arbor Type. Uses CTA Inserts. Click on "more info" for tool details. APT #SM612152. 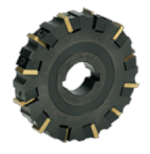 6" Cutter Diameter x .375-.530 Cutting Width Range x .330 Cutting Body Width x 1-1/2" Arbor Diameter. Slot Master Adjustable Width Indexable Milling Cutter - Arbor Type. Uses CTA Inserts. Click on "more info" for tool details. APT #SM612154. 6" Cutter Diameter x .485-.765 Cutting Width Range x .450 Cutting Body Width x 1-1/2" Arbor Diameter. Slot Master Adjustable Width Indexable Milling Cutter - Arbor Type. Uses CTA Inserts. Click on "more info" for tool details. APT #SM612126. 6" Cutter Diameter x .720-1.025 Cutting Width Range x .690 Cutting Body Width x 1-1/2" Arbor Diameter. Slot Master Adjustable Width Indexable Milling Cutter - Arbor Type. Uses CTA Inserts. Click on "more info" for tool details. APT #SM612158. 6" Cutter Diameter x .982-1.265 Cutting Width Range x .950 Cutting Body Width x 1-1/2" Arbor Diameter. Slot Master Adjustable Width Indexable Milling Cutter - Arbor Type. Uses CTA Inserts. Click on "more info" for tool details. APT #SM816122. 8" Cutter Diameter x .375-.530 Cutting Width Range x .330 Cutting Body Width x 1-1/4" Arbor Diameter. Slot Master Adjustable Width Indexable Milling Cutter - Arbor Type. Uses CTA Inserts. Click on "more info" for tool details. APT #SM816124. 8" Cutter Diameter x .485-.765 Cutting Width Range x .450 Cutting Body Width x 1-1/4" Arbor Diameter. Slot Master Adjustable Width Indexable Milling Cutter - Arbor Type. Uses CTA Inserts. Click on "more info" for tool details. APT #SM816128. 8" Cutter Diameter x .982-1.265 Cutting Width Range x .950 Cutting Body Width x 1-1/4" Arbor Diameter. Slot Master Adjustable Width Indexable Milling Cutter - Arbor Type. Uses CTA Inserts. Click on "more info" for tool details. APT #SM816152. 8" Cutter Diameter x .375-.530 Cutting Width Range x .330 Cutting Body Width x 1-1/2" Arbor Diameter. Slot Master Adjustable Width Indexable Milling Cutter - Arbor Type. Uses CTA Inserts. Click on "more info" for tool details. APT #SM816154. 8" Cutter Diameter x .485-.765 Cutting Width Range x .450 Cutting Body Width x 1-1/2" Arbor Diameter. Slot Master Adjustable Width Indexable Milling Cutter - Arbor Type. Uses CTA Inserts. Click on "more info" for tool details. APT #SM816156. 8" Cutter Diameter x .720-1.025 Cutting Width Range x .690 Cutting Body Width x 1-1/2" Arbor Diameter. Slot Master Adjustable Width Indexable Milling Cutter - Arbor Type. Uses CTA Inserts. Click on "more info" for tool details. APT #SM816158. 8" Cutter Diameter x .982-1.265 Cutting Width Range x .950 Cutting Body Width x 1-1/2" Arbor Diameter. Slot Master Adjustable Width Indexable Milling Cutter - Arbor Type. Uses CTA Inserts. Click on "more info" for tool details. APT #SM102022. 10" Cutter Diameter x .375-.530 Cutting Width Range x .330 Cutting Body Width x 2" Arbor Diameter. Slot Master Adjustable Width Indexable Milling Cutter - Arbor Type. Uses CTA Inserts. Click on "more info" for tool details. APT #SM102024. 10" Cutter Diameter x .485-.765 Cutting Width Range x .450 Cutting Body Width x 2" Arbor Diameter. Slot Master Adjustable Width Indexable Milling Cutter - Arbor Type. Uses CTA Inserts. Click on "more info" for tool details. APT #SM102026. 10" Cutter Diameter x .720-1.025 Cutting Width Range x .690 Cutting Body Width x 2" Arbor Diameter. Slot Master Adjustable Width Indexable Milling Cutter - Arbor Type. Uses CTA Inserts. Click on "more info" for tool details. APT #SM102028. 10" Cutter Diameter x .982-1.265 Cutting Width Range x .950 Cutting Body Width x 2" Arbor Diameter. Slot Master Adjustable Width Indexable Milling Cutter - Arbor Type. Uses CTA Inserts. Click on "more info" for tool details. APT #SM122424. 12" Cutter Diameter x .485-.765 Cutting Width Range x .450 Cutting Body Width x 2" Arbor Diameter. Slot Master Adjustable Width Indexable Milling Cutter - Arbor Type. Uses CTA Inserts. Click on "more info" for tool details. APT #SM122426. 12" Cutter Diameter x .720-1.025 Cutting Width Range x .690 Cutting Body Width x 2" Arbor Diameter. Slot Master Adjustable Width Indexable Milling Cutter - Arbor Type. Uses CTA Inserts. Click on "more info" for tool details. APT #SM122428. 12" Cutter Diameter x .982-1.265 Cutting Width Range x .950 Cutting Body Width x 2" Arbor Diameter. Slot Master Adjustable Width Indexable Milling Cutter - Arbor Type. Uses CTA Inserts. Click on "more info" for tool details.